We have heard so many times how easy hummus is to make, yet it was one thing that, for whatever reason, always seemed easier to just snag at the store when the mood struck us. But guys, holy cow, hummus might be the easiest thing to make–seriously. After making hummus for ourselves, we are not sure if we can even muster up the energy to reach our watch over to the cash register to pay for store-bought hummus. It is literally that easy. All you need is a food processor or a high-speed blender. The tools do the work for you while you just stand there. 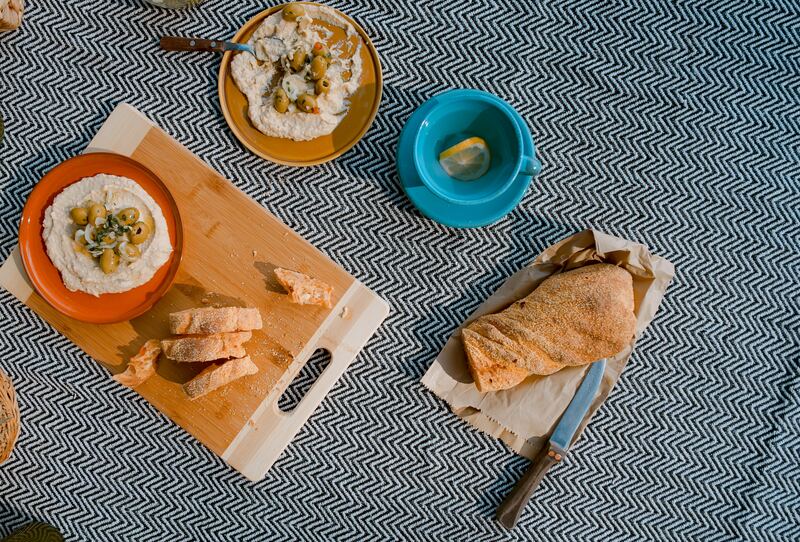 Hummus makes the best and easiest snack to always have on hand when the hunger strikes. All you need is some veggies and you are ready for snacking. Also, have you ever tried using hummus as a spread on a wrap or sandwich instead of mayo or some other condiment? Give it a try. You’ll thank us later! In the bowl of a food processor (or blender), combine the tahini and lemon juice and process for 1 minute, scrape the sides and bottom of the bowl then process for 30 seconds more. This extra time helps to make it nice and creamy. Then add the olive oil, minced garlic, and salt to the whipped tahini and lemon juice. Process for 30 seconds, scrape the sides and bottom of the bowl then process another 30 seconds or until well blended. Open, drain, and rinse the chickpeas. Add half of the chickpeas to the food processor and process for 1 minute. Scrape sides and bottom of the bowl, then add remaining chickpeas and process until thick and quite smooth. If your hummus still seems a bit gritty then slowly add in water little by little until the texture is to your liking.